You’ve fallen under Sri Lanka’s spell. You had expected to feel that way about India. But no. It ended up being its neighbor off the southeast coast. Galle. Kandy. Dambulla. Even Trincomalee. The Pearl of the Indian Ocean keeps pulling you back. Now your sights are set on its islands. Neduntheevu lies off the coast of Jaffna in the Palk Strait. If you’ve heard of the island, though the chances of that are slim, you’d probably know it as Delft Island. The Dutch named it after their pretty city, which is famous for its canals and medieval architecture, when they ruled Dutch Ceylon in the 17th and 18th centuries. They built a fort and a navigation tower on Neduntheevu. Their ruins still stand along the coastline. They left ponies, as well. Their feral descendants have roamed the flat island for more than 200 years. Except for these few reminders, the island is strictly Tamil territory. The Tamil people have lived in the Northern and Eastern Provinces of Sri Lanka for thousands of years. There was little tension on the ethnically diverse island until the Europeans arrived. Then the Portuguese, the Dutch, and the British created chaos. The country eventually gained its independence, but it quickly tumbled into a civil war. The Tamil people were on the losing side of the 26-year battle. The Jaffna District is just starting to recover. So Neduntheevu isn’t full of tourists. There are no beachfront resorts or restaurants. There aren’t even museums or tours around the historic sites. But there are sandy beaches and fascinating ruins. Only the basement is left of King’s Tower, which the British erected. Queen’s Tower was built by the Dutch. 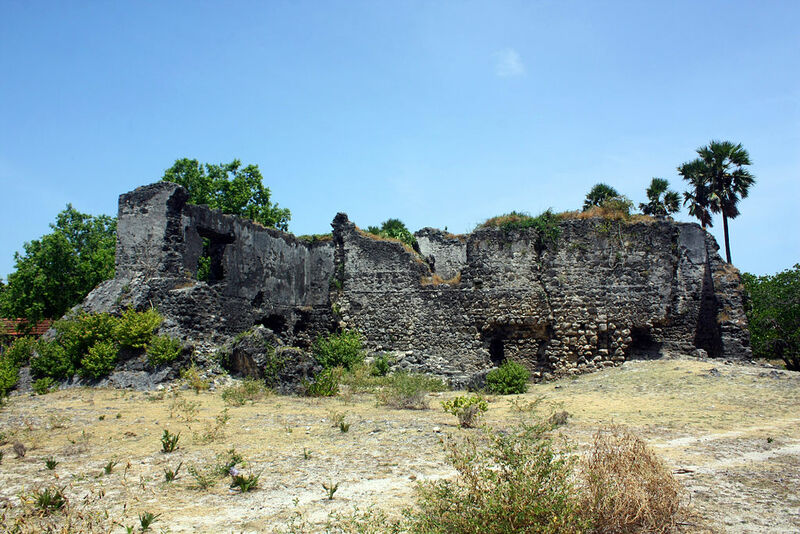 While a large Portuguese fort, made largely of coral, was one of the first European structures on the island. They’re all new compared to the ancient temple, though. The ruins of the temple, built by the Chola dynasty when they crossed the Palk Strait from India, are more than 1,000 years old. While they’re surrounded by palmyra palms, papaya trees, and shallow turquoise water. You’ll probably have them all to yourself. The ferry departs soon.